The best way to get in contact with Rehearsal Room is via the form below. Or ring Richard on 0407 226 620. All classes, workshops and events are held at our new venue below. Keep up-to-date with workshops and events. 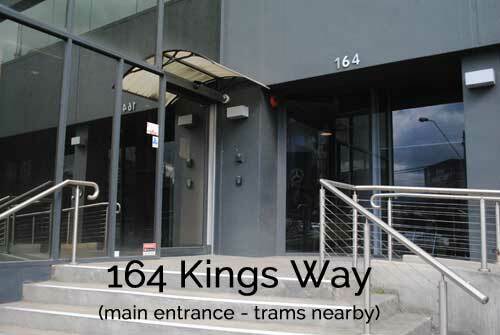 The main entrance is at 164 Kings Way, South Melbourne. On weekdays this door is often open. However, it only provides access to the foyer. You need to ring Richard on 0407 226 620 to gain further access. In the evening and on weekends come to this door and ring Richard for access. The No. 58 tram will drop you at Stop 117 just a minutes walk from this door. And the No. 1 tram is 6 minutes away. The Rehearsal Room office will also be at this address. Ring (0407 226 620) or email (contact@rehearsalroom.com) to make an appointment for one-on-one coaching or to meet to discuss class options. Parking is most easily found in Tope Street and York Street. READ THE SIGNS. 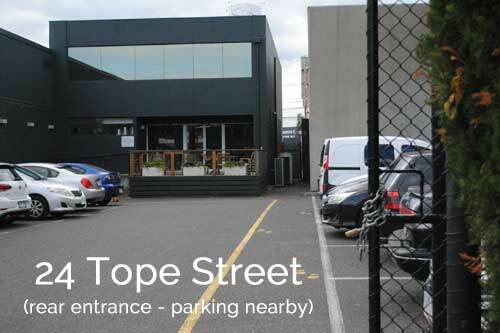 Once parked, the easiest access to the building is via the Tope Street entrance. Ring Richard (0407 226 620) on arrival. ALTERNATE ENTRANCE: The 24 Tope Street entrance operates on weekdays. On weekends go to the main entrance at 164 Kings Way and ring Richard.